Jared Cohen is the director of Google Ideas, an Adjunct Senior Fellow at the Council on Foreign Relations, and a nonfiction author. Previously, he served as a member of the Secretary of State’s Policy Planning Staff and as a close advisor to both Condoleezza Rice and Hillary Clinton. Cohen has conducted research in Iran, Iraq, Syria, Lebanon, Afghanistan, and throughout Africa. As part of his research, he has interviewed members of Al-Qaeda, Hezbollah, and the Taliban. He is the author of the books Children of Jihad and One Hundred Days of Silence and is currently co-authoring a book about the future of the world with Google Executive Chairman Eric Schmidt, which will be published by Knopf in 2013. He is also co-author (with Eric Schmidt) of The Digital Disruption: Connectivity and the Diffusion of Power, which appeared in Foreign Affairs just a few months before the Arab Spring. Among his additional publications are Diverting the Radicalization Track (Policy Review), Iran’s De Facto Opposition: Youth in Post-revolutionary Iran (SAIS Review), and Passive Revolution: Is Political Resistance Dead or Alive in Iran (Hoover Digest). In 2011, Vanity Fair named Cohen a member of the “Next Establishment,” The Washington Post and Harvard\’s Kennedy School of Government named him one of six “Top American Leaders,” and Foreign Policy listed him as one of the “Top 100 Global Thinkers.” He was named by Christian Science Monitor as one of the “Top 30 Under 30”; named by Business Insider as one of the “20 Brazen Young Professionals to Watch”; selected by the Huffington Post as one of “100 Game Changers”; and chosen by Devex as one of the “40 Under 40.” He also won the 2010 and 2011 Tribeca Film Festival Disruptive Innovation Awards for his intervention in Iran’s Green Revolution and most influential article of the year, respectively. He has been awarded the Secretary of State’s Meritorious Honor Award twice, once by Condoleezza Rice and once by Hillary Clinton. 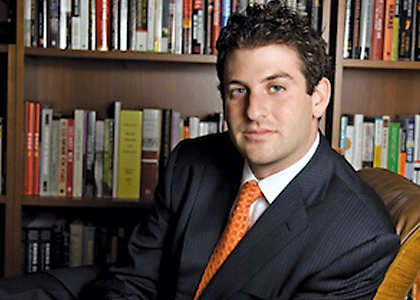 Jared Cohen currently serves as a member of the National Counterterrorism Center’s (NCTC) Director\’s Advisory Board. He received his BA from Stanford University and his M.Phil in international relations from Oxford University, where he studied as a Rhodes Scholar. Gifted at finding creative solutions to age-old problems – particularly with technology & foreign policy – Jared Cohen understands the powerful impact information-sharing technologies can have on today’s world. In this highly innovative and forward-thinking keynote, Jared Cohen examines how this shift in online demographics will affect geo-politics and corporations, as businesses and financial institutions will want to understand the needs and attributes of this new customer base in order to effectively serve it. Today, young people in democratic societies take full advantage of new technologies, finding it increasingly easy to connect to the new diplomats and change-makers of the 21st century. And where autocracy dominates, the youth of these nations will become the de facto opposition. Cohen deftly articulates this phenomenon, while outlining a path for these young people – from the world\’s most democratic to its most autocratic societies. We witnessed a physical attack on our nation on 9/11, as terrorists forcefully hijacked aircrafts and flew them into the Pentagon and Twin Towers. We’ve also experienced cyber attacks on our networks, as hackers on the other side of the world inserted malicious software into systems that operate some of our critical infrastructures. Now imagine a combined physical and cyber attack. In this gripping keynote, Jared Cohen looks to the future and predicts that in the new digital age, every state will have two foreign policies and two domestic policies: one for the physical world and one for the virtual world. And to make matters even more complicated, these physical and cyber policies will often contradict each other. Cohen shares his insights on what to expect in the future and what we can do to protect ourselves from coordinated physical and cyber attacks.